One way in which I know my work makes a positive difference is when clients I previously served ask to me help them out again. After last year’s very successful retreat with the Los Angeles Neighborhood Land Trust, I’m thrilled to have facilitated another staff retreat for them this year focused on a theme of story telling. As an organization, the Land Trust has incredible positive momentum behind them. To illustrate this, I asked retreat participants to form a semi-circle showing how long each of them have served the Land Trust, which ranged from a few weeks to six years. The size of the staff nearly doubled since last years retreat! I asked everyone to briefly share what issue brought them to work at the Land Trust and heard a variety of passionate answers. I then asked staff to pair up and share each other’s stories with each other in greater detail. This began a series of exercises and activities where we explored different kinds of stories nonprofits tell – stories their founding, people, strengths and positive impact they make on the community. One of the retreat highlights was hearing from one of the organization’s founders and current board chair, Misty Sanford. Sitting around a campfire like circle, Misty shared the compelling story of how the organization started – a small group of passionate people who responded to the need for small parks and community gardens in communities throughout Los Angeles. As she shared the story of the organization, she also weaved in her personal story and shared how it affected her career choice to become a lawyer serving in the public interest. Another highlight was an activity bringing the stories of the Land Trust people to life, led by one of their staff named Hop (when designing retreats with clients, I look for opportunities to engage staff in the leading of the retreat). Using movement, the outdoors and a narrative, Hop created a powerful place that reaffirmed the values staff prioritized at the previous year’s retreat. After that, we shared a relaxing lunch prepared by Homegirl Café and ate in the beautiful LA River Center and Gardens, one of the sites I recommend on my places to retreat list in SoCal. 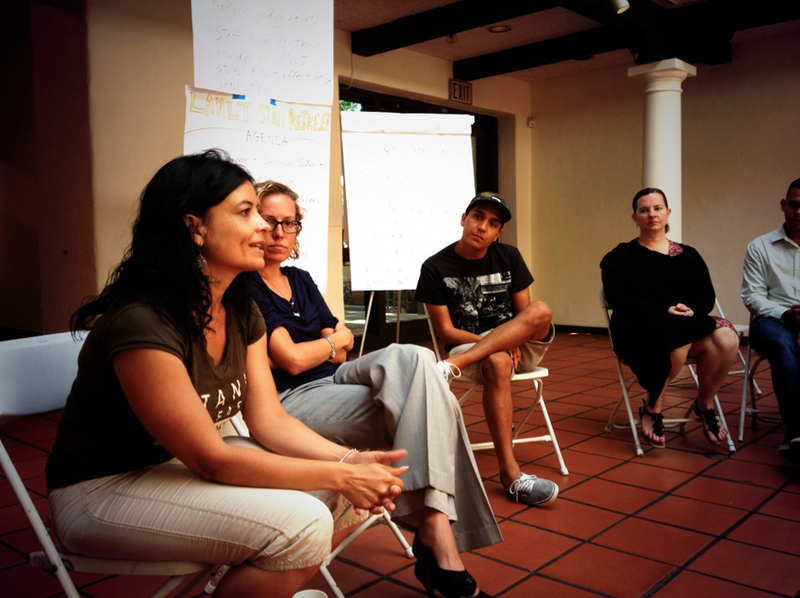 Both Homegirl and the LA River Center also have compelling stories associated with them. 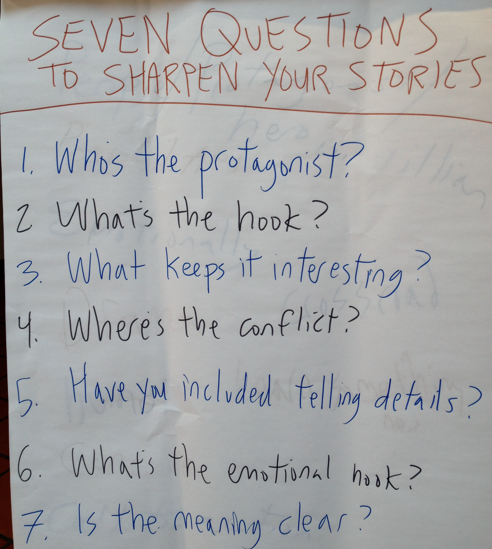 In the afternoon, I led them in a discussion reflecting on what makes a great story (a protagonist, context, conflict, emotion, etc….for a great blog post, check out this helpful list of seven questions to answer by Andy Goodman). I structured the retreat to give staff the opportunity to develop and share their own personal story. Building upon that, we transitioned to a group activity a similar to the one I led last year for the Los Feliz Improvement Association. Each group was tasked with developing a story that involved everyone about one of the parks or community gardens the Land Trust helped create. 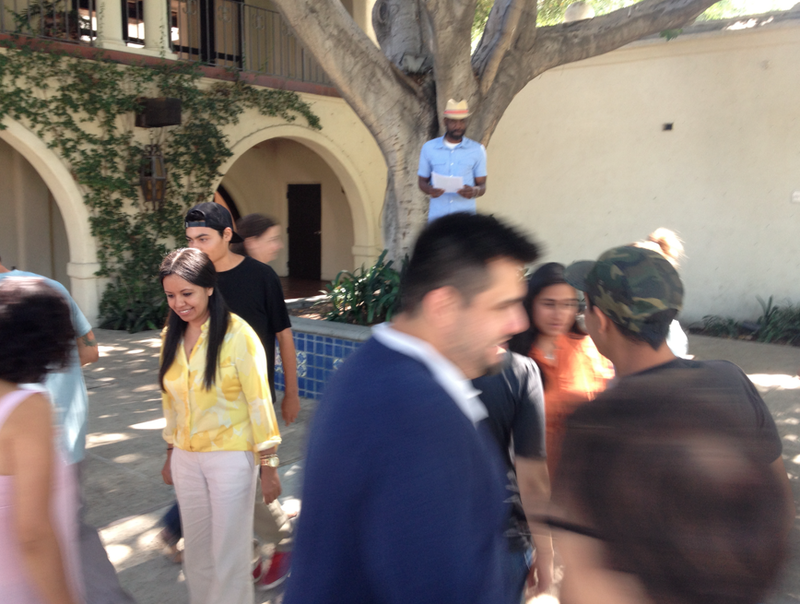 We did this because the following day, the entire staff planned to take a bus tour of their sites throughout Los Angeles. This activity prepared staff in small groups to give short presentations sharing the story of the site they planned to visit. I visited each group and listened to a trial run and can tell you they all came up with moving stories that brought these sites to life. After spending a day with Land Trust staff, I can tell you they are a passionate, diverse, committed and tight-knit group. Their work meaningfully engages communities throughout Los Angeles to create and maintain vibrant, needed parks and gardens. It’s not always easy and sometimes the forces against creating community feel pretty strong in this big little town of ours. Yet, they persist and continue to grow as an organization, creating a more livable, sustainable Los Angeles in the process. I’m honored and privileged to have spent a day with their 20+ staff members, hearing their stories, and even more grateful for their work. This entry was posted in Facilitation, Retreats and tagged #Nonprofit, #NPLA, Clients, Community, Facilitation, Leadership, Leadership Development, Retreats, Sustainability, Team Building. Bookmark the permalink.